Roe Ethridge, Chanel Necklace for Gentlewoman, 2014, C-print, 34 x 51". One might contend that art exhibitions, perennially hawking some ideology or creative vision, have more in common with the late-night infomercial—that most unseemly of genres—than we care to admit. Roe Ethridge makes that argument in “Nearest Neighbor,” a two-floor retrospective of sixty large-format photographs from 1999 to 2016. Aesthetically, these images hover above a Bermuda Triangle, one whose vertices are the ambience of luxury magazines, the innocent nostalgia of a family snapshot, and the corporatized, euphoric limbo of stock photography. Pigeons midflight; empty Coke bottles; women in swimwear, double-exposed against a throb of sunset; a Thanksgiving banquet—anything goes in the aggressively styled, unsettling camp in which this show revels. Borrowing from previously published iconography to recast his works in more playful, ironic roles, Ethridge plumbs a résumé that includes showing in a Whitney Biennial, shooting for publications such as Vice, and commercial endeavors for companies including Goldman Sachs. This artistic arbitrage invests the show, whose title is both a digital imaging term and a pattern-recognition method for data optimization, with the intimate distance felt between image and intent. These photographs mine the distrust and desirability evoked with product placement, as in Nancy with Polaroid, 2003–2006, where a dimpled, retouched model beams as the instant film is disgorged from her name-brand camera. 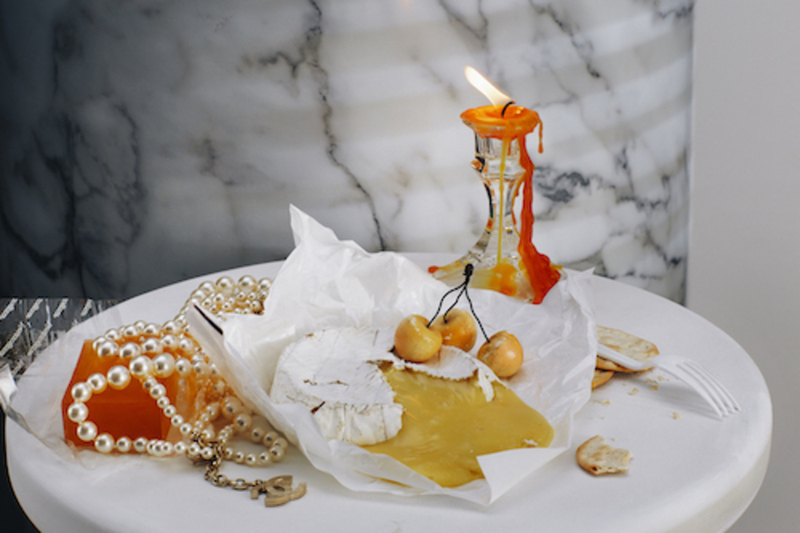 A candle’s slavering wax and a rind of Brie morbidly deliquesce in Chanel Necklace for Gentlewoman, 2014, a starkly decadent vanitas that also includes cherries, soap, pearls, and a plastic fork. These photos could pass as editorial ads, scrapbook entries, even postage stamps. Within the idiom of the purchasable, licensable and standardized, these pictures belong everywhere and anywhere. In a post-truth world besieged by unverifiable images, it’s suggested, you too can enjoy the same majestic abysm declared by empty vessels of Coca-Cola.